Oceanside is a small beach community located approximately 40 miles from downtown San Diego and is considered the northernmost city in San Diego County. It is bordered by Camp Pendleton to the North and Carlsbad to the South. It has a current population of about 179,000 and has experienced dramatic growth in the past two decades. 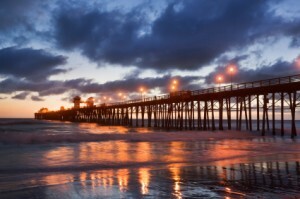 There are too many attractions in Oceanside to name, but a few of them include: The California Surf Museum, the Oceanside Pier (longest wooden pier in the Western United States, the bungalow house featured in the movie Top Gun is located on South Pacific Street, and the world’s 2nd largest beach soccer festival is held here each May at Oceanside Harbor Beach. Oceanside sits next to Camp Pendleton, a large marine base situated between Oceanside and San Clemente. Being a young marine wouldn’t be so bad if your base happens to sit seaside. Oceanside is an eclectic community people wise because of the mix of vacationers and marines. There is a younger element to Oceanside because of these young men and women, a family vibe, as well as a tourist hotspot, especially in the summer months. While Oceanside is not as convenient to get to as some of San Diego County’s other cities, it really makes up for it in terms of not only lifestyle, but home price as well. Oceanside sees lower real estate prices for much of the same attractions as the other cities, making it the place to get everything you want out of the San Diego lifestyle without the hefty price tag.